A popular name by itself: Amazon Web Services (AWS) is a comprehensive set of Cloud Computing Services which facilitates the build and deployment of highly scalable and refined applications. Supporting multiple technologies like Java and foraying into diverse domain areas like healthcare, finance, education and so on, AWS has proven to be a flexible, cost effective, secure and scalable experience for its users. But, as always, for any brilliant setup, there are certain dark areas which, if not taken care of, may spoil the entire show and lead to disastrous results. In order to avoid that, there are certain best practices which are a must while hosting any application in AWS’s cloud. Let us glance through them and ensure a secure and successful usage of AWS. AWS has always stressed on ‘shared security model’, in which it stresses on security of the physical components of its like machines, storage and security features, but on top of it, AWS expects the end client to implement certain security mechanisms also. It expects that a controlled usage of the administrative privileges and the focus on protection is equally the responsibility of the end user of AWS. With AWS, the end user now has to handle the credentials of the AWS console and the APIs. IAM is functionality provided by AWS, which allows you to have a secure and controlled access over AWS services and resources. Not allowing the end users to utilize the main link to sign in, IAM has its own user link for signing in. This url will allow the end users to create with their own username and password. It also follows the principle of least privilege in which access is granted to limited and required APIs and operations based on requirement, hence limiting the harm that can be done if full access is given. Implementing a Web application firewall is one of the most secure mechanisms to avoid a breach into your AWS setup. 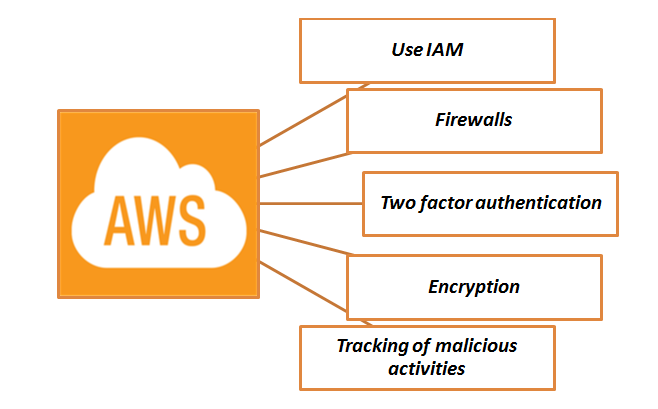 Such firewalls are available in the AWS marketplace and can be used to have a monitoring over the traffic flowing in and identify any type of unnatural behaviour to lock it right on time. The right way to let the hackers stay away from accessing your data is usage of two factor authentication, which needs users to enter two forms of verification while logging in the system like a password and a code. Even if we try hard, hackers have their own ways to get into our cloud. The other way to protect our information is to store it in the AWS’s cloud by encrypting it. There are certain software available in the AWS’s market place. AWS does have some basic encryption in its services but is limited to the protection of mass attacks, not for hackers accessing direct user information. Through certain AWS tools, it is very much possible to keep a track of the unauthorized access gained by certain suspicious entries, which can be stopped well in advance. This will strengthen the protection of the data in the AWS cloud and ensure security and protection. Try your best to save your AWS Cloud set up with these tips and tricks and as always, think two steps ahead of the hacker.